The Mediterranean Sea is the body of water that separates Europe, Africa and Asia. The Mediterranean Sea is connected to the Atlantic Ocean by a narrow passage called the Strait of Gibraltar. The sea is almost completely surrounded by land, on the north by Europe, on the south by North Africa, and on the east by the Middle East. It covers around 2.5 million km² (965 000 mi²). To the east it connects to the Sea of Marmara and the Black Sea, by the Dardanelles and the Bosporus. The Sea of Marmara is often thought of as a part of the Mediterranean Sea. The much bigger Black Sea is generally not considered part of the Mediterranean. The 163 km (101 mi) long man-made Suez Canal in the southeast connects the Mediterranean Sea to the Red Sea. The canal is between Egypt and the Sinai peninsula. It was built by the French Compagnie Universelle du Canal Maritime de Suez from 1859 to 1869. Some of the most ancient human civilizations were made around the Mediterranean Sea, so it has had a large influence on the history and ways of life of these cultures. It provided a way of trade, colonization and war, and was the basis of life (like fishing and catching other seafood) for many communities throughout the ages. The combination of similarly shared climate, geology and access to a common sea has led to lots of historical and cultural connections between the ancient and modern societies around the Mediterranean. Above all, it was the superhighway of transport in ancient times. It allowed for trade and cultural exchange between peoples of the region — Phoenicians, Egyptians, Carthaginians, Greeks, Romans, and the Middle East (Arab/Persian/Semitic) cultures. The history of the Mediterranean is important in understanding the origin and development of Western civilization. The ancient Punic Wars and the Battle of the Mediterranean during World War II gave the winners control over it so they could destroy the losers. 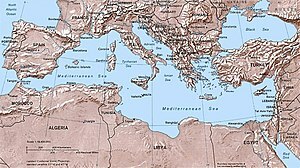 Today the Mediterranean Sea still connects the economies of Europe, North Africa, and the Middle East as it did in ancient times. The European migrant crisis resulted in many refugees drowning in the Mediterranean Sea. Almost 6 million years ago, continental drift closed the Straits of Gibraltar. With no water coming in from the Atlantic, the Mediterranean partly dried up. The remaining part became extremely salty. After half a million years the straits opened again, making the Mediterranean as it is now. Being nearly landlocked affects the Mediterranean Sea's properties. Tides are limited by the narrow connection with the Atlantic Ocean. The water is saltier, partly because of evaporation. The Mediterranean has a deep blue color. This page was last changed on 14 January 2019, at 14:20.